Derbyshire County Cricket Club's Daryn Smit. 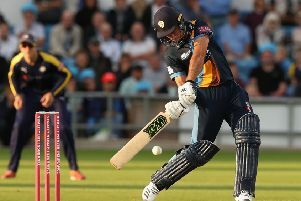 Derbyshire Falcons’ hopes of reaching the quarter-finals of this year’s NatWest T20 Blast remain in their own hands after a four-wicket loss to Leicestershire Foxes, says captain Daryn Smit. Leicestershire: Derbyshire Falcons 139-7 Leicestershire Foxes 143-6. Leicestershire win by four wickets. Leicestershire ensured they go into their final group match, against Nottinghamshire at Trent Bridge, knowing that a win will see them qualify for the quarter-finals. The Foxes’ win over the Falcons means that Derbyshire must also win their final match, at home to Worcestershire, to be certain of going through to the knock-out stages for the first times since 2005 – although they will also qualify if Leicestershire are beaten by the Outlaws. The key wicket, however, was that of Wayne Madsen, who came into the match having hit 457 runs in the competition this season, but had scored only 10 when he reverse-swept Ali straight into the hands of Callum Parkinson at backward point. With wickets falling at the other end, opener Matt Critchley set his stall out to bat through, and did so successfully, going to a run-a-ball 50 with a six, and finishing on 72 off 60 balls as the Falcons hit 44 from the last four overs of their innings to give their bowlers something to bowl at. Leicestershire’s reply was a nervous one, though it should not have been after they were given their customary flying start by Luke Ronchi. The former New Zealand international lost opening partner Cameron Delport to a fine diving catch by Madsen at backward point, but had hit 32 off 14 balls before he holed out to Alex Hughes at mid-on off Madsen. Derbyshire captain Daryn Smit said: “It was a strange surface, it looked good, but it didn’t really come on to the bat, and perhaps we should have played a little differently. “The batters have done in week in week out this season, but they were bound to have a slip-up eventually. “Critch was brilliant but we knew we were 20 runs shy and we’d have to be unbelievable in the field the restrict them. We weren’t far off but one good innings by Cosgrove got them over the line.